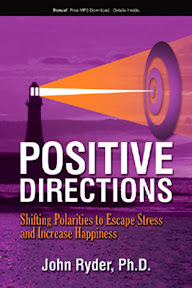 Positive Directions by John Ryder Ph.D.
John Ryder is launching his new book on 16th Sept . His book Positive Directions-Shifting Polarities to Escape Stress and increase Happiness. I feel that this book is exactly what I needed.It teaches me how to identify what is causing the negative thinking in my life and how to reverse it with positive thinking to help me reduce my stress and increase my happiness. The 328 page book will give you a better inside into the way your mind works and how to get around the negative feelings of feeling helpless, feeling of having your energy drained away stress with having to deal with kids 24/7. It also gives you an insight how to rid your life of complications and to simply it so that you are more at ease with yourself and be more peaceful. It is definitely a must read for all who are interested to get a better understanding of oneself and seeking a positive change to one’s mindset.